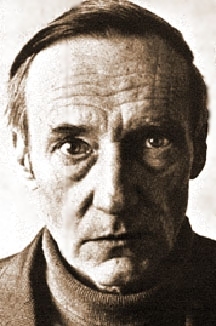 Back in the day, William Burroughs dreamed up a tool to inspire his students: color walks. It’s a pretty simple idea. Just walk out your door, pick a color that catches your eye, and watch your surroundings pop as you follow the color from object to object. While you walk, you’ll be struck by the red of a bicyclist’s shorts, the sunburn on a woman’s shoulders, the pealing paint on the fire hydrant. Give yourself an hour of uninterrupted time, no commutes, no errands, just eye time. Pick a color, or let a color pick you–follow the one that makes your heart go thump-thump. If you get lost, pick another color. If you get really lost, you’re on the right track. Could we not say, therefore, that with the color walk we are alerted to the singular and beautiful fact that color itself walks? This would make color even more of a ﬂâneur than Burroughs,who liked to call himself el hombre invisible in his walks through the market in Tangier in the late 1950s. What was invisible in Tangier became color in Paris, thanks to Gysin’s paintings painted in Tangier. Maybe people have to lose themselves first and become invisible as long-term residents in a third world country before being readied for the color walk? But then Burroughs was continuously marginal in utterly realistic as well as in utterly romantic ways. He was queer. He was a heroin addict. He loathed America. And he had weird ideas about most everything, especially writing. Being marginal can mean you switch on and you switch oﬀ because you are either too conspicuous or invisible. Too invisible, that’s the point, at which point you emerge as color, walking color at that. This entry was posted in Consciousness, PsychoLogy and tagged Issue 3. Bookmark the permalink.